The state of Indiana believes in its colleges, and it says so in dollars and cents. 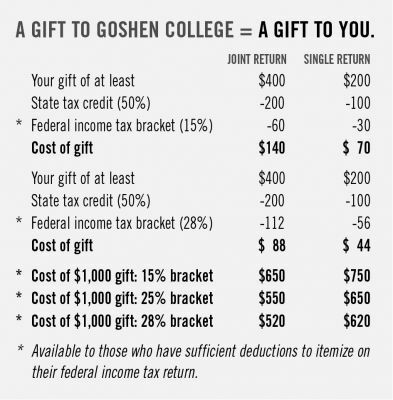 Indiana residents can receive a state tax credit for their financial support of Goshen College. An Indiana College Credit form (Schedule CC-40) must be filed with the contributor’s income tax return. In addition to this, you receive a federal charitable income tax deduction if you itemize. Indiana also offers state tax credit for corporations: 50 percent tax credit for gifts up to $2,000. The credit cannot exceed 10 percent of the corporation’s Indiana adjusted gross income tax liability. Or consider making a planned gift.